Termite infestations – Have you found mud tubes forming on your wall or at the side of your cabinet? Have you seen discarded insect wings on the ground around your home? Have you heard hollow sounds when tapping on wood or timber inside your house? If yes, subterranean termites may have already established their nest inside your house! If not, now is the time for you to do some prevention. Subterranean termites are known to be the highly destructive insect pests in the urban environment. Each year, about US$40 billion of damages were accounted worldwide. Their silent activities inside the structures can cause serious destruction well before you notice the infestation. No one wants their home to serve as termites’ food. Getting rid of them can be expensive and repairing of damaged structures can be troublesome. Therefore, it is vital to protect your house before the intrusion of subterranean termite infestations. 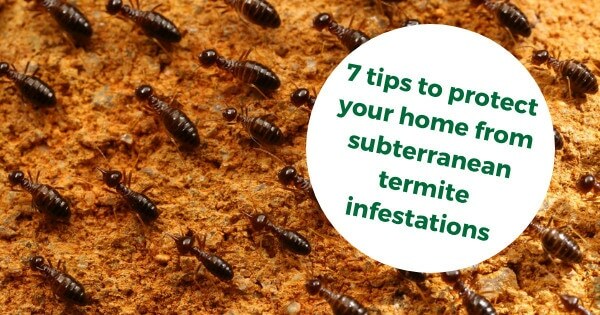 Here, we discuss 7 tips to protect your home from subterranean termite infestations. Understanding your enemy will help you better prepare against termite infestations. Hence, understanding the conditions that favour subterranean termite activities are important, for example their dependency on moisture. Moisture damage wood structures should be replaced as this types of wood is most welcoming for subterranean termite infestations. Moisture damage wood is one of the roots of moisture problems in every house. Ensure crawl spaces (floor joints and subf-looring) are properly ventilated to minimize the amount of moisture around the areas. Leaky pipes around your home need to be repaired to prevent water from leaking into wooden siding and windows. Furthermore, trim all shrubs near home exteriors can help to quickly dry damp areas. Synthetic mulch can be used when landscaping. Unlike wood mulch, it does not feed termites and any other pest. Besides, pea gravel can be used for keeping your wood mulch from contacting your home’s foundation. Planter boxes abutting building wall can give the chance or facilitate the process for foraging termites to enter the building. Make sure there is no close proximity between planter boxes and building walls to avoid future subterranean termite infestations. Wood polishes not only give a good looking appearance to the wood used but also provide a protective coat to the wood. It can also provide water resistance to the wood which helps reduce the moisture source for subterranean termites. Make sure wood polish is applied thoroughly on the wood surfaces including the edges and sides of the wood used to prevent any entry point found by subterranean termites. Subterranean termites are the most highly destructive insects that can damage your home. Early detection of subterranean termite infestations can help to avoid financial burden. Hire a pest control professional who is trained in termite detection. They have adequate equipment and experience to look for the tell-tale signs of termite infestations. This management treatment can be divided into treatment prior to construction (pre-construction soil treatment) and after construction (corrective soil treatment). Pre-construction soil treatment involves creating chemical barriers in the soil around and under the building foundation to prevent the intrusion of soilborne subterranean termites. Corrective soil treatment, in contrast, creates chemical barriers along the perimeter of the building. The occurrence of subterranean termite infestations can become challenging to house owners to successfully manage on their own. Proper inspection and identification of the type of termites is a more efficient way to manage them. Click here for further information. Killem Pest can solve your problem!